Nobody wants to get up one day to head off to work and other important things only to find that their car is trapped in the garage due to an unexpected malfunction of the door. The best way to avoid this frustration is by getting regular maintenance performed. This lowers the chance of an abrupt break because it allows experts to check over your door and catch these problems in the making to take care of it now, rather than on an emergency trip later. It also helps elongate the lifespan of your door overall by keeping it in the best shape possible! The longer your door has to function with problematic parts, the more damage will occur, so it’s best to have it checked out now. The tension of your garage door springs is very important for keeping it working smoothly. If there’s too much tension, your door won’t be able to close correctly and this may leave your belongings and home open to strangers who would take advantage. Should the tension be too loose, your door will be off balance and it puts a strain on the springs which could cause them to break more quickly. In either case, the best thing to do is simply have one of our professionals take care of adjusting it back to perfection! That way you won’t have to worry, and your door will be working easily again. Particularly if there are children or pets who may be near the garage door, getting your safety sensors checked every now and then can help keep them protected! The sensors are what tell the door to stop and reverse if someone or something has moved beneath the door while it’s closing. However, these sensors can be bumped out of alignment over time, which means they aren’t working as well as they should. We’ll make sure they’re doing their job! 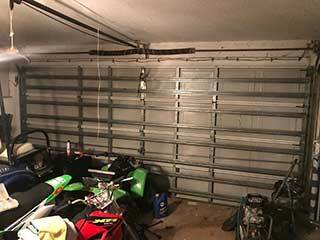 Contact Garage Door Repair Lino Lakes for all your door’s needs.